Tired of recreating the same boring salad? Here are some tips to refresh your appetite for salads AND make it E-A-S-Y. Take a variety of raw nuts and seeds, bake at 300 degrees for 5-7 minutes, stirring once during cooking. Let cool, add dried fruit (raisins, blueberries, cherries) and store in sealed container. 4. When ready to chow down, here are the remaining steps for the yummiest, heartiest, nutritious salad ever!! 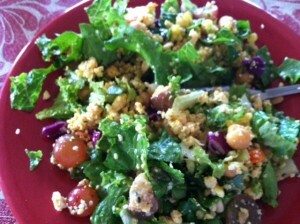 Toss greens salad with some of the bean/tofu mix. Add any leftover brown rice or quinoa if you’re feeling really crazy. Drizzle olive oil over salad and toss (or toasted sesame oil for a treat). Top with your nut mixture (or some basic nuts, seeds, and berries) and some hemp seed hearts (my favorite).